I have links below to poetry venues and other comrades in the written and visual arts. Email me if you'd like to suggest a link of your own. 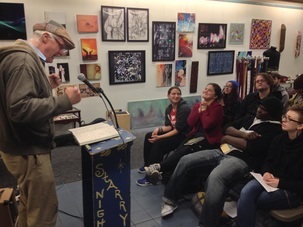 One of the longest running poetry venues in Massachusetts, Stone Soup was founded by the late Jack Powers and for over a decade met every Monday evening in Cambridge at the recently closed Out of The Blue Art Gallery. I have set up a home on the web here. We also have a presence on ﻿﻿Facebook﻿﻿ and ﻿Meetup.﻿ Stone Soup is currently meeting whenever and wherever it can. For now, check out the News for the latest dates and locations. I also edit its online semi-retired journal, Spoonful. Check out the issues here. Jason Wright founded his online magazine a few years back as a way of featuring his own work and the work of others he believed in. Since Stone Soup partnered with Oddball Magazine, Jason has incorporated a number of Stone Soup's open mic ("in house") talents, including James Van Looy. 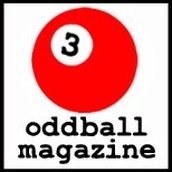 Now Oddball Magazine averages at least five posts a week (ideally 1-2 posts per day). Click the link here and either bookmark the homepage or follow us through WordPress, the magazine's current home base. We have a lot of great work slated for 2014 and more coming in. Also consider submitting if you're a poet, writer or artist of any style.